PETA will have a field day. @ Monique: Have you lost your spirit of randomness? @ Marf: I doubt they're being rescued. The bucket doesn't have a bottom- they're all sitting on dirt. oh hellz to the no... love the random.. you and vid seemed to be talking specific. 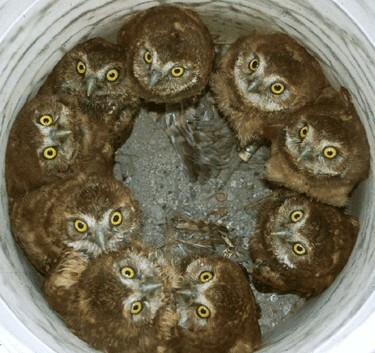 leave it to me to over think pic of owls.